You are invited to a very special evening: a free opera preview in Palo Alto. This is West Bay Opera's first production ever of I due Foscari. Based on Lord Byron's historical play of the same name, it tells the story of Francesco Foscari, the Doge of Venice. His 34-year rule ended tragically in Protected content , when he saw his son Jacopo sentenced to exile for treason. He was later forced to abdicate and died soon thereafter. This opera was one of Verdi's most important early successes. The powerful score has beautiful arias, ensembles and choral music and it requires virtuosic singing and orchestral playing. We present it unabridged and fully staged, set in the splendor of early renaissance Venice. If you have never attended an opera or aren't sure if you can sit through a full opera, then this event will be a great introduction for you! After the preview, we will be able to meet the opera singers! The preview will be followed by open Q&A and complimentary light refreshments where we can meet each other and talk afterwards. 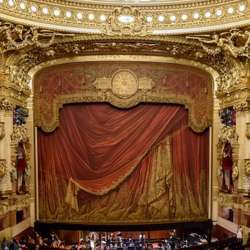 *I have attended these previews and they are really a treat to be up close to the performers and hear a few highlights of the opera in an informal setting. It's casual, so no need to dress up, but wonderful if you do!